The Keysight N9020A is available to buy refurbished used or rent, usually from our UK stock. Click here to download the Keysight N9020A datasheet. 40, 85, 125 or 160 MHz analysis bandwidth. Fast sweep capability ships standard on new instruments equipped with Option B40, DP2, or MPB; fast power measurements available as Option FP2. Real-time spectrum analyzer capabilities with 100% probability of intercept for signal duration as short as 3.57 s.
+/-0.23 dB absolute amplitude accuracy -114 dBc/Hz phase noise at 10 kHz offset; +20 dBm third order intercept (TOI) -166 dBm displayed average noise level (DANL) with preamplifier and get up to 9 dB further improvement with noise floor extension (Option NFE) -78 dB W-CDMA ACLR dynamic range (with noise correction on). Supports >25 measurement applications, covering cellular communication, wireless connectivity, digital video and general purpose. 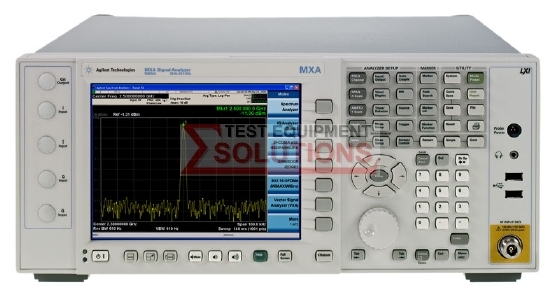 Advanced analysis of more than 75 signal formats, software runs inside the MXA with 89600 VSA software. Agilents PowerSuite one-button power measurements included as standard. LXI compliant, SCPI and IVI-COM. USB 2.0, 1000Base-T LAN, GPIB. Programming remote language compatibility with PSA, 8566/68, and 856x. We offer the refurbished used Keysight (Agilent) N9020A 3.6, 8.4, 13.6 Or 26.5GHz MXA Signal Analyzer for sale and rental. The Keysight N9020A is fully tested and refurbished in our in-house ISO9001 calibration laboratory. We supply manuals, accessories, full warranty and a free-of-charge Certificate of Conformity. We can also provide the Keysight N9020A with a fresh calibration for a small additional charge. If you have under-utilised test equipment talk to us about trading-in or part-exchanging it towards the Keysight N9020A or other refurbished test equipment.